Porsche 962-113 to be unveiled at the Amelia Island Concourse on March 13, 2016. 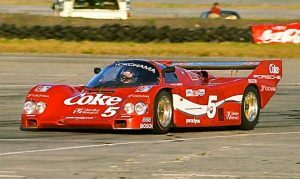 Porsche 962-113, the 1986 Sebring 12hr winner and one of America’s most photographed and Iconic Porsche 962’s will be unveiled at the Amelia Island Concourse on March 13, 2016. The extensive period correct restoration was completed by Velox Speed with support from Gunnar Racing, both headquartered in Florida. 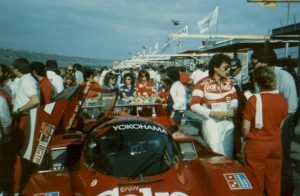 Restoration was undertaken to preserve the significance of the original tub, body as well as mating the car with the correct era drivetrain in order to return 962-113 to the “exact” specification that existed at the start of the 12 Hours of Sebring on March 22, 1986. 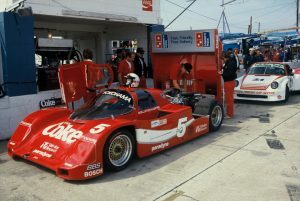 As the overall winner 962-113, driven by Hans Stuck, Bob Akin and Jo Gartner, set a speed and distance record of 1,344 miles with an average speed of 115.852 Mph. This record still stands today! Hans Joachim Stuck, a double LeMans winner and 1985 World Sports Car Champion is the honorary Grand Marshall of Amelia Island Concours for 2016. Velox will honor Stuck by unveiling it’s original, period correct and Sebring race winning 962-113, some thirty years after the date of Stuck’s 12 Hour of Sebring victory. The car will then be showcased all weekend at Amelia Island Concours. Rooted in a successful motorsport background, Velox competed in the IMSA ALMS GTC class fielding a Porsche, scoring a race win at Mosport and finishing 3rd in both team and driver points for the 2010 American LeMans Series (ALMS). Velox manages a select few historic and current race cars and has a record of distinction for motorsport track/race preparation including support and full maintenance programs. Off the track, Velox has developed a world renowned reputation for extraordinary restorations.Most recently, the team has been recognized with the prestigious Cavallino Ferrari Cup, Cavallino 1st in Class Award as well as several Platino Awards for Ferrari restorations. The Amelia Island Concours d’Elegance now in its second decade, is among the top automotive events in the world. Always held the second full weekend in March, “The Amelia” draws over 250 rare vehicles from collections around the world to The Golf Club of Amelia Island and The Ritz- Carlton, Amelia Island for a celebration of the automobile like no other. Since 1996, the show’s Foundation has donated over $2.5 million to Community Hospice of Northeast Florida, Inc., Spina Bifida of Jacksonville, The Navy Marine Corps Relief Society, Shop with Cops, and other deserving charities. The 21th annual Amelia Island Concours d’Elegance is scheduled for March 11-13, 2016.